Well, here's what I purchased at the Photo Expo West, a Think Tank Photo Modulus belt system. 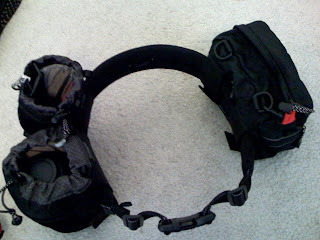 I got the "Whip It Out" for my long telephoto lens, "Lens Changer 50" for my 24-70mm and 16-35mm f2.8 lens, and finally Think Tank belt. It's just under $110 with 10% discount at the Expo. This Saturday, I will put this belt system to the test. Stay tune for the verdict. ;-) By the way, the accessory pack in the above photo is not a Think Tank accessory bag. It's a Lowe Pro bag which I purchased 8 years ago. It fits perfectly, and it's much cheaper in price than the "Trim Changer" @ $40.